a musical by Stephin Merritt and David Greenspan. Catch this Chicago premiere! Beware, here be some spoilers! -The Beldam (as the Other Mother is also known) is a creature of glamour. A ‘glamour’ in faerie folklore is a magic spell of seeming; the ability to enchant one thing to appear as something else altogether. It is frequently used in stories by faerie creatures to appear more beautiful, or welcoming, or powerful than they actually are. In this case, the Other Mother uses glamour, both on herself to appear more like Coraline’s mother, and on her world to make it more enticing to Coraline and other victims. 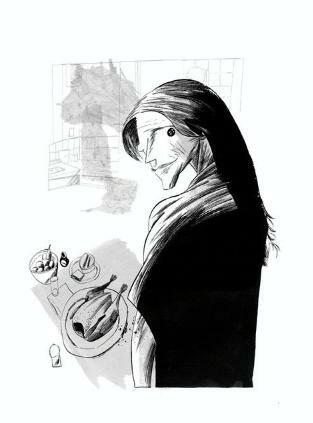 -Much is made in the original text (though to a lesser extent in this adaptation) about the danger of eating the Other Mother’s Food; it makes Coraline’s head feel fuzzy and makes her more compliant and less able to see through the Other Mother’s illusions. In the original novel, Coraline even brings her own food supply with her when she goes back to rescue her parents. This idea is also drawn from stories of faerie folklore. According to the old stories, it is terribly dangerous to eat food when you go to fairyland; the results can be anything from being transformed into an animal (as on the Island of Circe in The Odyssey) or being trapped in the realm forever (Persephone eating pomegranate seeds in the underworld) or even turning to dust if one ever reaches the ‘real’ world again. In this production we’re exploring that idea a bit further to make more clear why the first thing the Other Mother does when Coraline first arrives in the Other World is to serve a meal. Eating the food of the Other World gives the Other Mother certain powers and rights over Coraline, even if Coraline does have some kind of protection with her. -….which brings us to the ‘little stone with a hole in it.” Such stones are known variously as ‘witch stones,’ ‘hag stones,’ and ‘faerie stones.’ According to folklore these stones are supposed to be protection against evil, and in the story of Coraline, a hag stone definitely serves that purpose. Looking through a hole in a faerie stone is also one way to see true things instead of the false illusions of glamour, and Gaiman’s story gives the little stone that ability, too. -One other concept that frequently crops up is the idea of Changelings; of people being ‘spirited away to fairyland’ with something else being left behind in their place. In this production, we’re exploring that idea a bit as we examine the spiriting away of Coraline’s parents. How, exactly? You’ll need to check out the production to see! Kate is owner and curator of Sacred Art Gallery in Lincoln Square, where she represents over 100 independent artists. She is a freelance writer, marketer, business consultant, event planner and meditation teacher. The Midwest Premiere of Coraline, a musical by Stephin Merritt and David Greenspan, comes to Chicago in summer 2014! Runs August 8 - September 6 at City Lit Theater. Have you seen Coraline yet? Tell us what you thought!